One of four consecutive buildings with fake storefronts in Dún Geimhin/Dungiven. Painted boards have been placed over the windows and door (and the handle put back on the door?). The helpful “closed” sign prevents confusion! 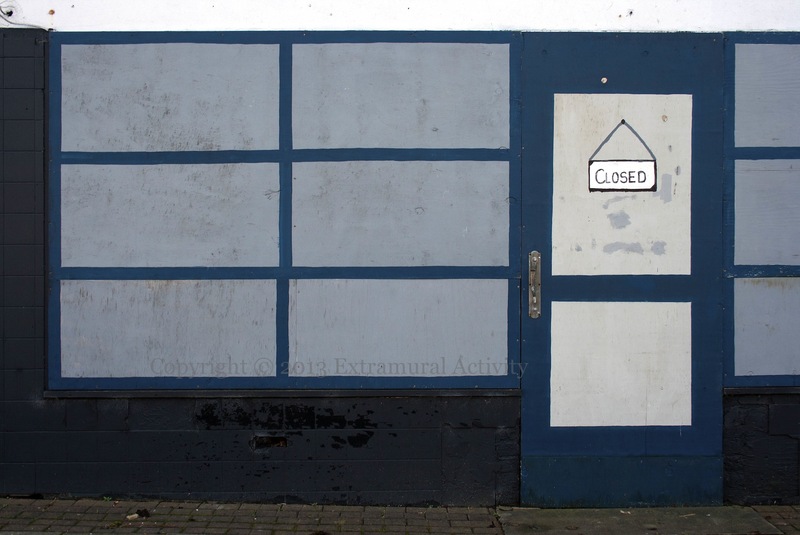 Previously featured fake storefronts on the Newtownards Rd: Down The Shops | Semiotics. And relatedly: Recession In Fivemiletown. 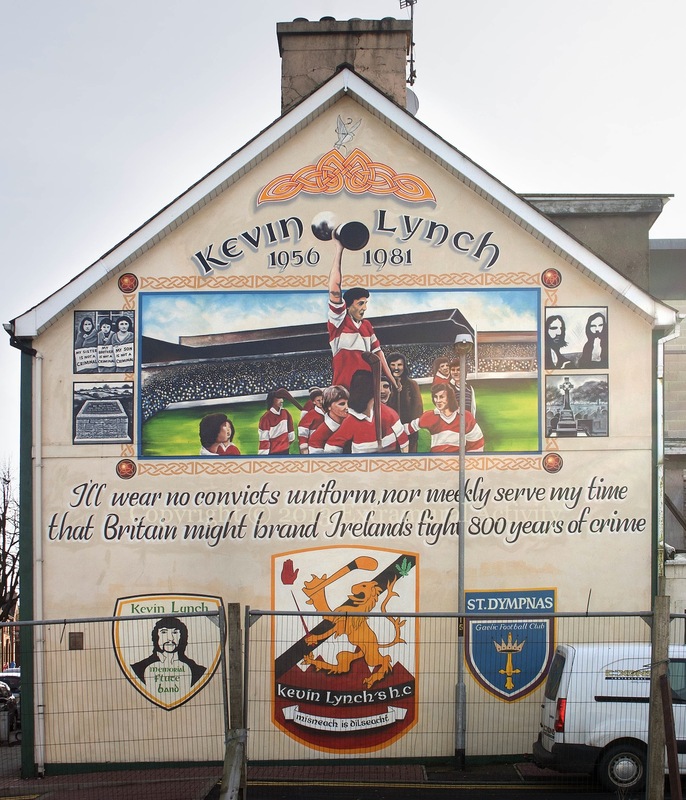 Mural to Kevin Lynch (WP) in Dún Geimhin/Dungiven. Lynch died after 71 days on hunger strike – the longest-surviving striker – in Long Kesh/the Maze prison. Of the four black-and-white squares, the bottom left is of the memorial to Lynch in nearby Park, where has was born, the top right is a version of this picture, and the bottom right is of his gravestone in Dungiven. Lynch raising the Under-16 County Derry hurling trophy. 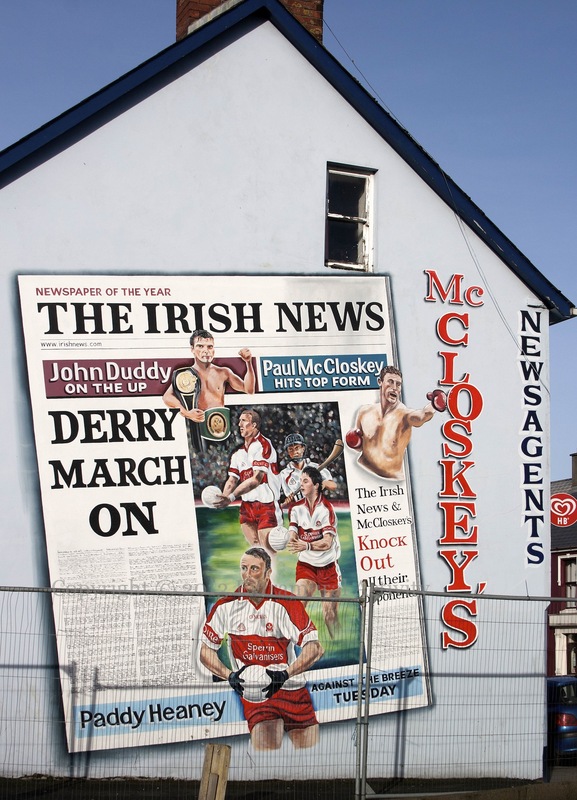 A commercial mural in Dún Geimhin/Dungiven promoting McCloskey’s newsagents and the Irish News by association with Derry (Gaelic) footballers (and a hurler in the background) and local boxers John Duddy (from Derry) and Paul McCloskey (WP) who was born in Dungiven (and is presumably related to the shop owners?? ).